When Yolanda hit Tacloban in 2013, the surge of volunteers in the area posed another challenge—where do they stay? Two siblings, Jacques and Lucia Palami, were just some of the many volunteers who had that problem. Jacques was running a 'truck bar' that drove around the city that still didn’t have power. He served cold drinks to Taclobanons, local and international aid workers and fellow volunteers. It was a social project that attempted to put life back in a city that seemed to still be in shock. One night, the truck parked in front of an abandoned building for rent. Jacques saw potential in the building which he checked out the next day. He called Lucia and instantly, they knew what they wanted to do with it. Both Lucia and Jacques are graduates of the University of the Philippines Diliman, College of Mass Communication. Lucia studied Communication Research while Jacques completed a Film degree. The siblings were also privileged to have been both selected as participants to the Global Xchange program for two separate years. This program gathers a few young Filipino and British people to volunteer both in the Philippines and in the UK. This experience exposed Jacques and Lucia to the NGO sector. 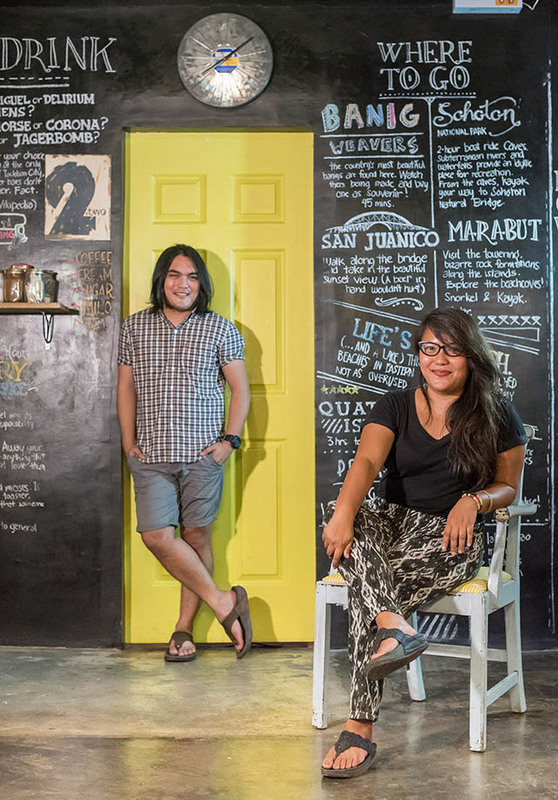 When Yolanda devastated Tacloban, the siblings naturally wanted to help. At the time, Tacloban was also benefiting from the unprecedented rise of tourist arrivals in the city. In the absence of nature-based experiences in Tacloban, tourism took on a social function. Lucia knew a permanent social “center” for the growing community was needed. “We knew we had to act fast. We would normally be a lot more calculating, but in that intense post-disaster situation, when things were changing every day, we knew what our guts were telling us,” Lucia said. 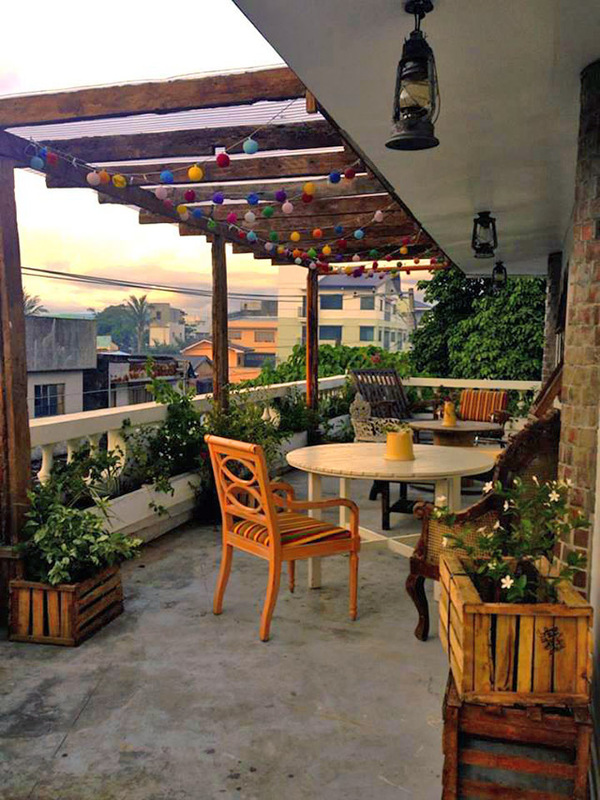 Lucia and Jacques converted the abandoned building on the corner of Burgos and Juan Luna Streets into a hostel with private and dorm rooms. It was primarily designed with upcycled furniture from the typhoon's debris. They named the place Yellow Doors Hostel. 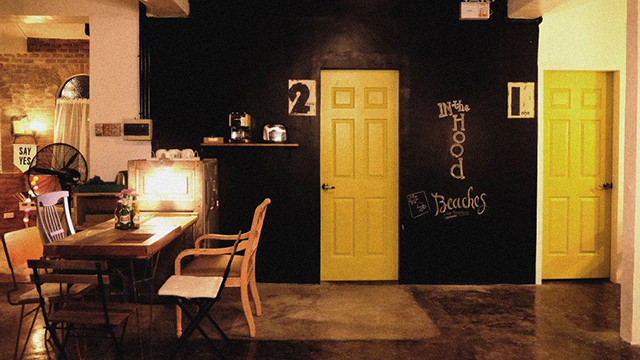 “More than just offering accommodations, Yellow Doors Hostel really exists to contribute to the creative economy development of Tacloban,” Lucia explained. Lucia added that for years, she and her brother have been joking about opening a hostel every time they would come home from traveling. “We felt that while staying in hostels, we had opportunities to learn about ourselves through meeting other people and seeing other places. We’ve never traveled together, funnily enough, but we always knew we wanted to carve the same space for the traveling community in our hometown,” she said. In their plans, they knew that if they were to pursue the plan, it wouldn't be in Tacloban, which wasn’t exactly in anyone's must-see list at the time. This was before the supertyphoon hit, before viral Facebook videos of their beaches and before 'influencers’ visited them. “Then, Yolanda happened, and again, the story mattered more than the potential income. The story of us opening our doors to other people and finding purpose in the destruction was the core of the project. We were both passionate about and comfortable in that,” Lucia said. “We also enjoy traveling so much. The 'business' side had to follow. We identify as a social business and so we both knew it was patient capital and that there was no expectation of a quick profit,” she added. When they started operations, the siblings faced several challenges. One of them was the lack of knowledge about what a hostel is compared to hotels, inns, etc. “Amongst locals, there was limited understanding of what a hostel really is, compared to hotels, inns, etc. A few people actually approached us to say there was a typo on our signage. That was a challenge because the very concept of the hostel is what sets it apart from other types of accommodation. The social aspect is its edge, and some people didn't know we offered that,” she said. Although these people were not their target clients, they both wanted Yellow Doors Hostel to feel like a community. “We knew that if we were in this for the symbolic purpose and what YDH represents, we had to be inclusive, even if that meant having to explain the business to every person who walked through our doors,” Lucia added. Then there were the logistical challenges. The renovations began just a few months after Yolanda, when the city was still feeling the damage. Prices were significantly higher than normal. Getting materials in from Manila was hard. Luckily, the two are the youngest of 16 children and their siblings were very supportive of the project and helped them out in many different ways. Despite these initial roadblocks, establishing a hostel in Tacloban had its upsides too. According to them, while the market in Manila is significantly bigger, having the business in Tacloban has become so much easier. “We both lived in Manila for roughly 10 years, so just getting away from all that stress that only a big city can give you was a relief. Running a social business like ours requires us to be creative and to be in the right frame of mind to keep to our mission. That is hard to do when you have to spend two hours stuck in traffic, inhaling pollutants,” Lucia said. Of course, competition is also low. They are the only hostel in the city which makes for a quick and easy Google search result for potential guests. "The story of us opening our doors to other people and finding purpose in the destruction was the core of the project," says Lucia. "We were both passionate about and comfortable in that"
One of the other things they realized was that something about being in the province allows for a stronger sense of community. “There is a feeling of 'Everybody knows everybody' and things can be done faster that way,” Lucia said. Both proprietors of the hostel, 30-year-old Jacques and 32-year-old Lucia are very hands-on. 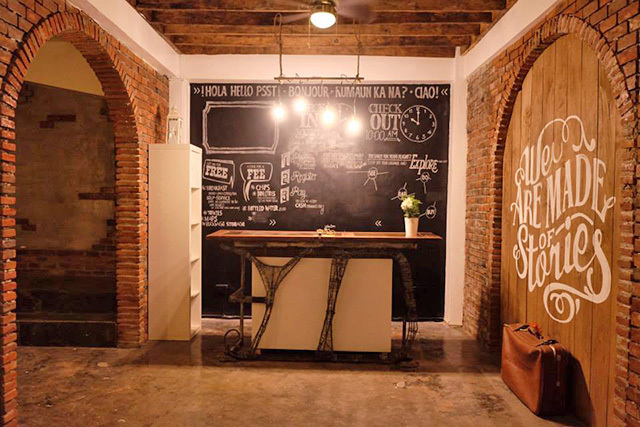 “We’re a small-scale hostel, so you’ll see either of us staffing reception and take bookings on some days. On most days, we work on overseeing and developing hostel activities or programs, in collaboration with other local movers and shakers,” Lucia said. After the first year, Jacques and Lucia discovered that they were filling a need among the community. 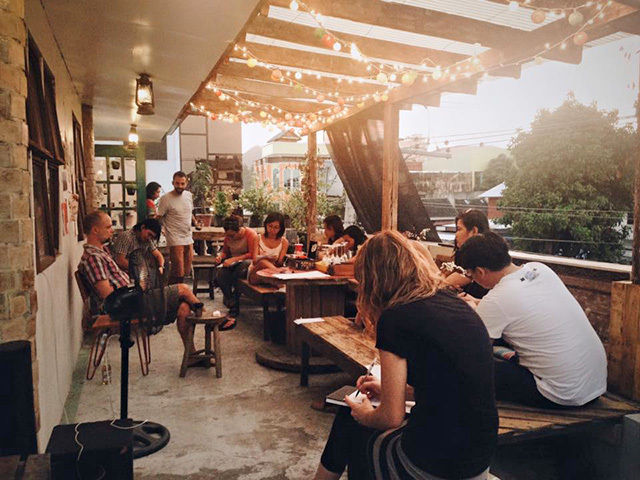 Part of running a hostel involves coming up with activities for guests. They are both involved in the arts, in one form or another, so the activities they were coming up with had something to do with the arts. “As an effect, Yellow Doors Hostel was becoming a center for art, culture and community connection. We then decided that if we were to keep to the Yellow Doors Hostel story, we should use the income to sponsor bigger and similar events, as well as funding social projects that we were involved in,” she said. The plan is to go where the story leads them. There is a growing movement locally towards a zero-waste lifestyle, especially after Yolanda. So in the next few months, they will be working with and hosting local organizations exploring innovative approaches to green living. “We are looking at slowly transitioning into a creative hub. The general thrust is towards transforming the communities in Tacloban into a lively, collaborative, and most importantly, sustainable places with culture and arts at the center,” she said. Looking back, Lucia and Jacques are both glad about their decision—a decision that started with their gut feeling during a time when a community badly needed a space for comfort and recreation. “We followed our gut feel. And we're happy that we did,” Lucia said.